Its your job to know exactly what is on all your client systems  and sometimes it seems like an impossible task. Not anymore. Apple Remote Desktop has been designed to make it easy to find, track and report all the information you need to stay on top of things. 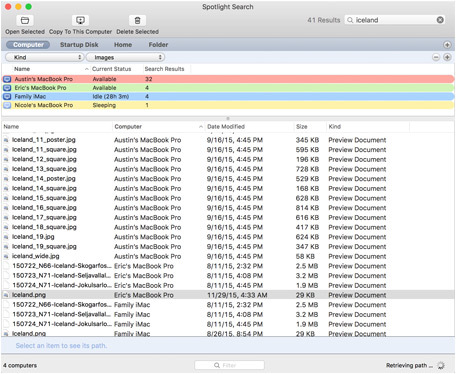 Harnessing the power of the revolutionary Spotlight technology of OS X, the new Remote Spotlight feature performs lightning-fast, user-specified searches on remote client systems. Its the easiest way ever to find specific files or folders. And adding additional qualifiers with different metadata can further refine your searches. Once you find what youre looking for, copy the files from the search results back to your own system or delete where appropriate. When you need to supply system information, Apple Remote Desktop can help by collecting data on more than 200 hardware and software attributes on each of your network Mac computers. The data is stored in a SQL database, and you can choose from 12 report types. Or you can use third-party reporting tools to connect to the database and generate custom reports. Apple Remote Desktop can also be integrated with other data sources, such as help desk trouble ticketing systems. Collect information on everything from what applications are being used in your network to who is using which systems, what version of the operating system is running, and exactly what is installed on every one of your Mac systems. New reports in Apple Remote Desktop include the user history report, which tracks who has logged onto a computer, when they logged in and out, and if the computer was accessed via the console or remotely using SSH. The new application usage report details which applications have been used on report systems. This information can be used to ensure compliance with your software licences and identify any unauthorised use of applications in your organisation. You can set OS X computers to rebuild and send data on their hardware and software settings on a regular schedule, or only as needed. And its no problem to keep track of system profiles even when your Mac computers arent connected to the network. Just specify how often these systems should update their information in the database. When they do reconnect, system data will be automatically recorded and sent to you.